Was browsing for business / entrepreneurship books in GoodReads.com and I was reminded of this title. Vaguely familiar with the title as I encountered it almost 8 years ago when I was still with my previous employer (the company ran an employee awards program with the same title, but not necessarily related to this book). Recommend this book to company leaders (and officers), as well as to budding entrepreneurs (like me) who want to create a good (and eventually great enterprise). Easy read, methodical, and Juan can learn many things and fundamentals. Jim and his team surveyed American companies to narrow down a number of good to great companies. The selection criteria was stringent, with minimum 30 years of company life. Aside from good-to-great (G2G) companies, a benchmark of “good comparison” companies, and a number companies which showed “unsustained greatness” were also chosen. Throughout the course of the book, these companies are analyzed side by side to determine what sets the G2G companies apart. Level 5 Leadership: Low-key performer, directs credit to his team, or even to luck, not necessarily charismatic, not a rockstar, and usually comes from within the company, not a savior from outside. Builds sustainable leadership by hiring the right people, enables the company to prosper even after the leader is gone. 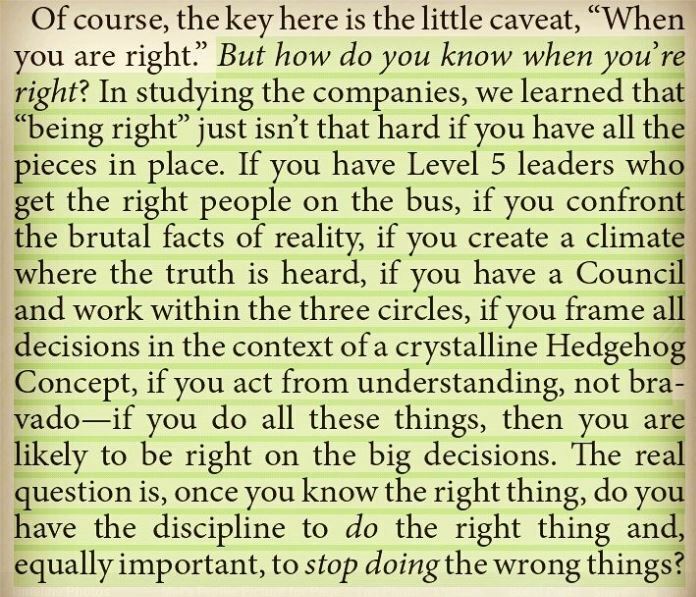 Disciplined People: The right people (and not just people per se) is the company’s best asset. G2G companies even hire the right people even if they don’t know yet where to go, which direction to take the company, or where to put these people. Getting the wrong people off the bus asap, and getting the right people in it, enables the bus to decide which is the best way to go. 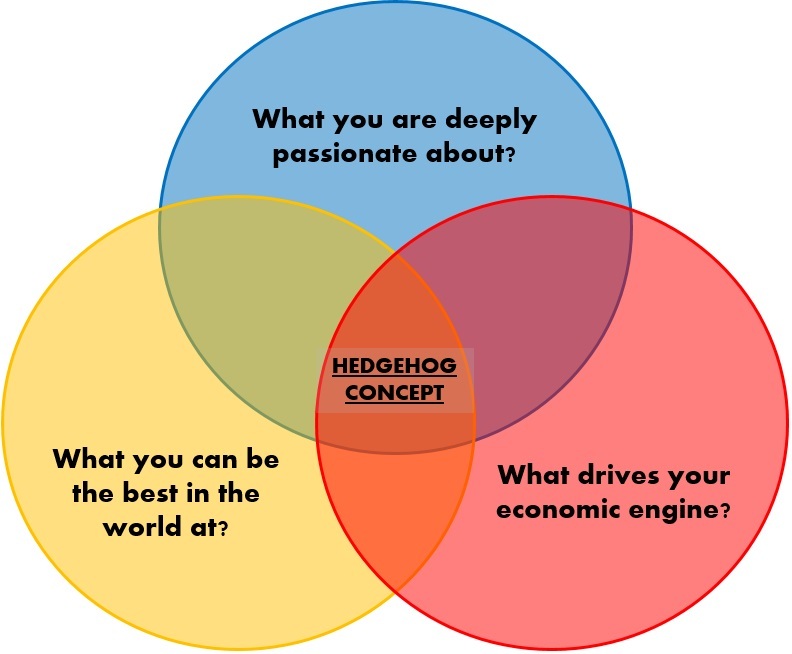 Hedgehog Concept: The company tries to find its sweet spot, its Big Hairy Audacious Goal (B-HAG based from Built to Last, also by the same author). A financial planner I once met calls this “bliss”, the intersection of the company’s (or a persons) passion, competence and profitability. If a company is able to find this, stick to it and refine it as needed, then it’s on track to being a G2G. Technology Accelerators: G2G harnessed the right technologies, they were not necessarily the first in such technology, but they clearly understood how available technology can further accelerate the company flywheel. Technology did not cause the greatness, the greatness was there all along, slowly building up, technology merely catapulted the company into greater heights. In the end, it is impossible to have a great life unless it is a meaningful life. And it is very difficult to have a meaningful life without meaningful work. Perhaps, then, you might gain that rare tranquility that comes from knowing that you’ve had a hand in creating something of intrinsic excellence that makes a contribution. Indeed, you might even gain that deepest of all satisfactions: knowing that your short time here on this earth has been well spent, and that it mattered. Adherence to the idea of “first who” might be the closest link between a great company and a great life. For no matter what we achieve, if we don’t spend the vast majority of our time with people we love and respect, we cannot possibly have a great life. But if we spend the vast majority of our time with people we love and respect—people we really enjoy being on the bus with and who will never disappoint us—then we will almost certainly have a great life, no matter where the bus goes. The people we interviewed from the good-to-great companies clearly loved what they did, largely because they loved who they did it with.